The Russian Soyuz rocket launches from the Baikonour Cosmodrome in Kazakhstan. Each of Space Adventures' spaceflight participants launched aboard a Soyuz rocket. An American space tourism company that sells multimillion-dollar tourist flights to the International Space Station announced today (Jan. 12) that it will resume the high-society spaceflights in 2013, after a five-year lull. Virginia-based Space Adventures will have three seats available on Russian Soyuz space capsules per year starting in 2013, according to a new agreement with Russia's Federal Space Agency (Roscosmos) and the country's spacecraft manufacturer, RSC Energia. Space Adventures has arranged eight private space tourist flights to the station for seven people (one billionaire customer flew twice) since 2001. The last tourist to fly to the station with Space Adventures was Canadian billionaire Guy Laliberte, founder of the circus troupe Cirque du Soleil, who used the trip to advocate global access to clean water through his nonprofit ONE DROP Foundation. Laliberte reportedly paid $35 million for the 11-day trip. 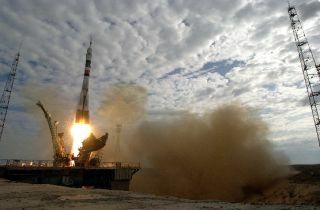 The new deal to send paying tourists to the International Space Station was made possible, in large part, by the planned increase in production of the nonreusable Soyuz spacecraft – to five spacecraft per year from the current four, adding an extra flight to the launch schedule, Space Adventures officials said. "We are extremely excited to announce this agreement and would like to thank our Russian partners in increasing Soyuz production and providing Space Adventures [with] these well-sought-after transportation services on the only commercially available manned spacecraft currently in operation," Eric Anderson, the company's chairman, said in a statement. The trips will last an average of 10 days, and the distribution of the additional seats allotted to Space Adventures will be decided by Roscosmos and the other space station partners, Anderson told SPACE.com. Alexei Krasnov, director of Human Spaceflight at Roscosmos, said: "The addition of a fifth Soyuz spacecraft to the current manifest will add flexibility and redundancy to our ISS transportation capabilities. We welcome the opportunity to increase our efforts to meet the public demand for access to space." Space Adventures, which was founded in 1998, is the only company that has booked private flights to the International Space Station. California-based tycoon Dennis Tito became the world's first privately funded space explorer with his high-flying trek to the space station in 2001. A string of wealthy individuals followed, with American billionaire Charles Simonyi flying to the station twice, in 2007 and 2009. Laliberte was the most recent to fly; the supply of seats dipped after his trip, as the space station's professional crew of astronauts and cosmonauts increased to six people. "Since Guy Laliberte's mission, there has been an increase of interest by private individuals, organizations and commercial entities seeking ways to access the space station," Anderson said. "We have been speaking with these parties about science, education and multimedia programs and hope to make some major announcements in the coming year." Space Adventures is remaining tight-lipped about what it will charge for upcoming orbital trips. "We don't really talk about financials, but the cost is dependent on a lot of things, including the time spent in space, exchange rates, and things like that," Anderson said. Interested customers will not have to wait long to throw their hat in the ring – the seats are already up for grabs. "They're on sale now, as in 'today,'" Anderson said. The agreement will likely help Space Adventures break new ground in the era of private spaceflight. The company has also partnered with aerospace giant Boeing to sell passenger seats for future flights on the Crew Space Transportation-100 (CST-100 capsule), which is currently in its development phase. "Cumulatively, our clients have spent almost three months in space, traveling over 36 million miles, and have been true ambassadors in sharing their experience and explaining to millions of people around the world why it’s important to explore space," Anderson said.